I've posted some links and information below to help you. If what you're looking for isn't there, please feel free to contact me at jamesfly.51@gmail.com. James Fly grew up in Denver, Colorado and joined the U.S. Coast Guard at age 19. After the service, James earned a B.A. in journalism from Pacific Union College, Angwin, California, then edited various church and college publications, plus two weekly newspapers. He lived in Abidjan, Ivory Coast for four years, employed by the Africa Indian Ocean Division of Seventh-day Adventists and later worked in the development office of a Benedictine monastery and seminary college in Northwest Missouri for two. Since 1995, James has co-owned and managed A- Z's FreshAir Fare, a small family health food store in downtown St. Joseph, Missouri. In 2011, he graduated from the Institute for Integrative Nutrition with a certificate in health coaching. He is a charter member of the Glass Eye Art Gallery at Tobiason Studios in St. Joseph and belongs to the St. Joseph Writers Guild, as well as the Midwest Artists Association and the Albrecht-Kemper Museum of Art. His two previous books are Africa Adopted Us published by the Pacific Press and ImprovEYEzzation, a collection of visual jazz published by XLibris. The father of three boys, Eric, Ryan and Hans, and the grandfather of Ethan and Mariah, James lives with his wife, Connie, in Northwest Missouri. Poetry and Photography by James Fly. Click here to order from Amazon. 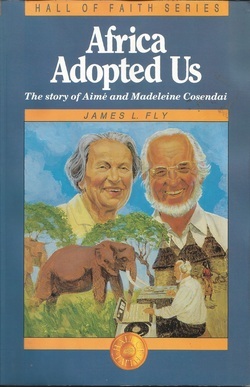 Despite the many hardships they encountered, including the loss of their daughter to whooping cough, the tragic death of a friend by wild animal, and severe injuries sustained in an auto accident, Aimé and Madeleine Cosendai, Swiss missionaries to Africa, still count their years of mission service among the Cameroonians a privilege rather than a sacrifice. This is a love story--not only the story of how a missionary couple comes to love and "adopt" the African people they came to serve, but a story of how the African people come to love and adopt the missionaries as their own--as people they knew really loved them. And as you read, you'll come to love them all. Published by Pacific Press Publishing Association.